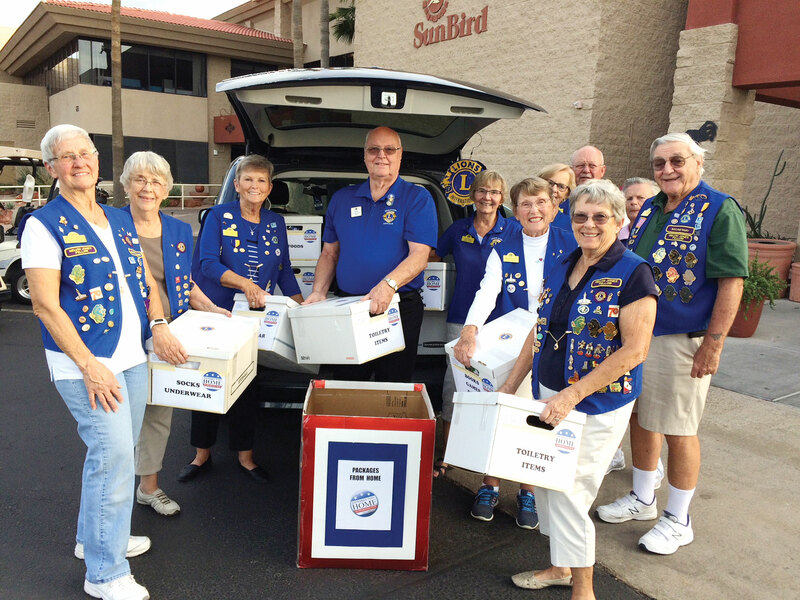 On November 11, the SunBird Lions Club held the annual “Salute Our Veterans” Golf Tournament and also collected donations for the “Packages from Home” organization. Both the golfers and members of the community brought donations to the golf tournament or left them in the dedicated box in the community center. The donations of goods collected by the Lions this year included 109 pairs of socks, 12 pairs of underwear and 215 pounds of assorted items that filled 12 cartons. The items collected were assorted toiletries such as shampoos, powder, lotion, bar soap, hand sanitizers, tooth brushes and toothpaste. Also donated were many paperback books, boxes of greeting cards, pads of paper, pens, games, many decks of playing cards and assorted puzzles. There was also 65 pounds of varied snacks and canned goods, such as pretzels, bags of candy, gum, canned soups and peanut butter and jelly. Several people made monetary donations that added up to $175. This cash will help deflect the cost of postage incurred when mailing these boxes of home goods to our troops. The “Packages from Home” organization was very appreciative of everyone’s generosity. This annual project of the SunBird Lions Club was a huge success and provided us with a gratifying way to both “Salute our Soldiers” as well as “Salute our Veterans.” The SunBird Lions would like to thank all those who donated to this worthy cause.